The Clinton County commissioners are going to continue visiting township trustee and village council meetings throughout 2019. This ongoing practice is an attempt by commissioners to keep closer tabs with the townships and villages in Clinton County, while also providing residents an opportunity to see commissioners in their own part of the county and at times that differ from the twice-weekly commissioners meetings in the courthouse. On Jan. 24 commissioners attended the meeting of the Richland Township Board of Trustees. 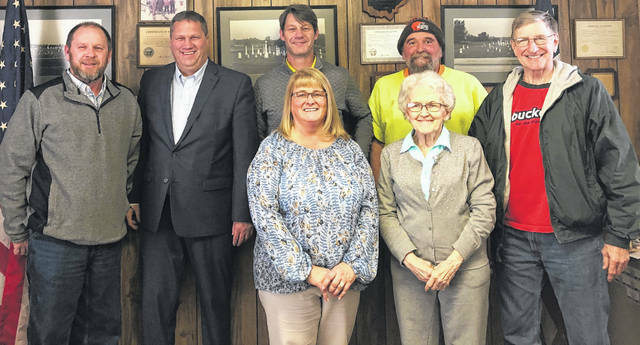 From left in the front row are Clinton County Commissioners President Brenda K. Woods and Richland Township Fiscal Officer Shirley Rittenhouse; and from left in the back row are Trustee Bob Hazelbaker, Commissioners Mike McCarty and Kerry R. Steed, and Trustees Rick Grove and Ken Fliehman. Commissioners plan to join Marion Township trustees at 7 p.m. Wednesday, Feb. 6 in the Marion Township Meeting House, and to join Liberty Township trustees at 7:30 a.m. Wednesday, Feb. 27 in the Liberty Township Meeting House.